According to Huxley, the mind had what he called a "reducing valve" - the product of its evolution in the harsh realities of day-to-day survival - and that it acted automatically to filter out all the fabulous, super-luminescent suchness of the world as it truly was, leaving instead the bleached, boring, and all-too-ordinary one that I was more used to. That quote is from Ptolemy Tompkins book The Beaten Path. Ptolemy is the son of Peter Tomkins who wrote the New Age bestseller The Secret Life of Plants. Aldous Huxley's book The Doors of Perception, which the quote refers to, was influential in many ways including providing the name of the rock group The Doors. Huxley's advocacy of mescaline to by-pass the mind's reducing valve is today quite rightly considered unwise. Yet the mass media's chemical-free ways of enhancing the action of the valve so it accepts the bleached, boring, and all-too-ordinary are encouraged. Perhaps this blog should be renamed "By-passing the reducing valve". Keith Jarrett's ECM disc of organ improvisations Spheres was recorded on an 18th century organ in a Benedictine Abbey. He achieved fabulous, super-luminescent suchness by, contrary to accepted practice, pulling some of the organ stops out part way. Which is an excellent and risk-free way of by-passing the reducing valve. The single CD is an edited version of the original 1976 2 LP set Hymns and Spheres. You can still buy the LP set from ECM. 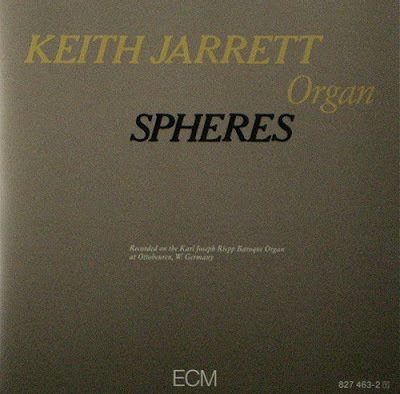 But it is a mystery why the label have never transferred the complete original release to CD as, for me, it is one of the best things Keith Jarrett has ever done. Also recommended for a painless reducing valve by-pass is Jarrett's 2 CD set of clavichord improvisations Book of Ways. Despite his 1975 The Köln Concert bankrolling ECM for decades Keith Jarrett has avoided the "one-work performer" tag. But can he avoid the one YouTube video tag? Jim Morrison beyond the doors of perception makes an appearance on another overgrown path.